Here's a selection of questions we get asked a lot. If you can't find the answer you need give us a call on 0371 200 0725 or email us from the contact us page. Why should I choose Voucher Express for my gift list? So you offer vouchers ... what else is different? Do the vouchers have expiry dates? 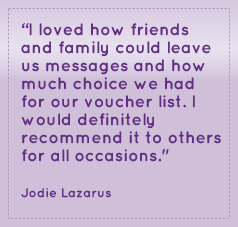 Do you offer any additional benefits for having the Gift List with Voucher Express? How do my guests place an order? Some of my guests are based abroad, are they still able to place an order? How do I make sure my guests do not feel obliged to place an order onto our list? Can I change my mind about the charity option? Can I exchange my account contents for cash? Can you have more than one Gift List registered under the same email address? How and what can I add to my Gift List? How and when will my gift list be active so guests can place orders? Can I amend my choice of vouchers after choosing them? Can we customise our homepage to welcome our guests when they login and edit it at a later point? Once I have set up my Gift List, how do I let my guests know? Do I have access to view the contents of my Gift List? Can guests see what other guests have given us? How do I know when guests place an order on to my Gift List? Is this list kept up to date? Can I cancel my gift list at any time if I decide not to have it anymore? What happens if I close my list early? Can anyone view my Gift List? Does it cost anything to place an order? What information is needed to place an order to an existing gift list? How secure are my account contents? How secure are payments made on the website? How and when should I close my List? How will my vouchers be packaged? When will my vouchers be delivered? How do I contact you if I have any queries not listed here? How can I send you feedback about your service? We think we offer a very different service to other Gift List operators. Our Gift List offers flexibility and choice and is geared primarily at offering retail gift vouchers and gift cards from the UK's very best retailers and brands. Our service is free to use, includes free delivery for your guests and offers the opportunity to give up to 10% of your gift list to a named charity. Over the years we have managed gift lists for hundreds of people receiving gift vouchers and gift cards to spend at their leisure and delivered at a time to suit them. Because we want this to be a useful, fun service we'll provide your own gifting home page with its own unique URL and Event ID. You can choose to customise your page as frequently as you want, update your greetings message and use it as a communication board up to, and after your event. During the registration process there is an option for you to donate up to 10% of your final account value to a charity. We have a choice of popular charities but if you have any suggestions for others we will consider adding them to our list. We arrange payment to the charity by sending a BACS payment directly to the relevant charity. Please note that we will only issue charity donations for £10 or more. If your total charity donation is for less than £10, it will automatically be added to your final account balance. Click here to see the charities selection. Some gift vouchers and gift cards do have expiry dates, details of which can be found within the relevant voucher/gift card information. Click here to see our full range. Yes we do. With the Voucher Express Gift List you can order free invitation inserts to inform your guests of your account. You can order your free invitation inserts via the 'Manage' section of your Gift List. We can take orders online by accessing your webpage via the provided Event Name, if the guests has lost or forgotten the login details then they can do a simple search on the site to find the gift list by its name or the provided Event ID. Alternatively they can place the order over the phone with our team of friendly and helpful staff. If you have chosen to password protect access to your homepage your guests will need to be provided with this in order to place an order online but can place an order over the phone without it. Find our number in the contact us section. Yes, the site can accept orders from overseas customers. As long as all mandatory fields are filled in on the order form and their type of card is one that we accept then that’s fine. You will need to set up the Gift List before you send out invitations and they are usually sent out about three months before the wedding. However you can set up the event list at any time, its completely up to you. We recommend at least 3 months before the wedding so you have ample time to communicate with your guests.Try it now! Informing your guests about a gift list could make you feel awkward. The important thing to do is not make your guests feel obliged to place an order or buy you a gift by keeping the mentioning of the gift list light and breezy. Our invitation inserts are worded in ways that make the guests know it is their presence at the event that is more important than whether or not they place an order but at the same time providing the information required to do so. Alternatively you can simply inform them of your event website to obtain further information and add any message regarding the actual placing of an order/giving a gift as part of your welcome message anyone logging in will see. If you would like a sample of our inserts or for help with wording of the information about the list on your invitations then contact us via any of the methods listed in the contact us page. This is the major advantage of having an online gift list. We understand that its difficult to get the etiquette right when choosing to have a gift list which is why we make our Gift List as customisable as possible so you can address the topic of gifts for events such as weddings or birthdays without feeling cheeky or inpolite. So instead of asking your guests to a visit a specific shop to choose something from an impersonal list or feel guilty for asking friends and family for money, choose to have a Gift List where you can get the best of both worlds, no unwanted presents and the freedom and flexibility to choose your own gifts at a time to suit you. You can also edit any details at any time from the "My homepage" section on your dashboard. You can set up your account without the charity donation option and decide to add it at a later stage by making changes via your dashboard. However, once you had decided to include a charity donation, you cannot change this option after the first order has been pledged to your account. This is because your guests have been informed that a proportion of their gift will go to your chosen charity. Please note that we will only issue charity donations for £10 or more. If your total charity donation is for less than £10, it will automatically be added to your final account balance. No, we do not offer that service. As a company we deal with Gift Vouchers and one of our unique selling points is our wide range of vouchers available to you in exchange for your Gift List contents. We are confident that whatever it is you would like to receive as a Gift for your event, it will be covered by a Gift Voucher or Gift Card that we offer. Click here to see our full range. Yes, you can. When registering your details use the same password for the additional lists and when logging in, a list of the registered Gift Lists will appear for you to choose from. Simply select the type of vouchers or gift cards you would like to receive from our extensive list. You can choose any number of different retailers, gift cards or vouchers and choose whether you wish to place a 'cap' on the amount given towards each one. You also have the option to add specific products sourced from Virgin Experiences and other carefully selected partners. Alternatively you can choose to have an "open pot" account which means your guests give a monetary gift that accumulates until you close the account - at which point you choose to redeem that value for the vouchers, gift cards or products you would like to receive totaling the value in your account. After the initial 20 second registration process your homepage is ready to use although you'll probably want to personalise it before making it available to your friends and family. You'll receive a confirmation email providing you with your bespoke web address and links to the control panel allowing you to edit your gift selections and homepage. Once you're happy with the look and feel, use our free stationery to promote your Gift List to your guests and family to use. Yes. You can change your mind about your selections at any point as long as we haven't sent them to you. The last point of deciding what type you would like is the point when you close the account and confirm your redemption choices. Yes it is part of the customisation of your own occasion website. Not only can a personal message be left but you can also customise the colour theme, choose a picture from our available gallery or even upload your own. You can also add as much or as little information about the event as you wish, including venue, dates, times & dress codes. This is the major advantage of having an online gift list. We understand that its difficult to get the etiquette right when choosing to have a gift list which is why we make our Gift List as customisable as possible so you can address the topic of gifts for events such as weddings or birthdays without feeling cheeky or inpolite. So instead of asking your guests to visit a specific shop to choose something from an impersonal list or feel guilty for asking friends and family for money; choose to have a Gift List where you can get the best of both worlds, no unwanted presents and the freedom and flexibility to choose your own gifts at a time to suit you. You can also edit any details at any time from the "My homepage" section on your dashboard. We can supply you with invitation inserts that provide all the information your guests will need in order to visit your occasion page and then place the order onto your gift list. They also display our telephone number so if your guests prefer, we can place the order for them over the phone. Remember that if you set a password for your guests to access your gift list then you will need to include that on the insert so they can enter it when placing an order online. If your guests choose to place the order over the phone they will not be asked for the password. See an example of the insert here. The service is set up in a way that means you have access to amend, add to and close the account and webpage at any point. We also update you, if you wish, via email when any additions are made to the list to keep you completely up to date with the contents of your list. No. We don't display any information on orders placed or messages left by any of your guests on the homepage. An automated email is sent to you when additions are made to your Gift List that lets you know an addition has been made to your account. You can then view the order and all the other contents of your Gift List from the 'My Gift Reports' section. Yes all orders once placed are confirmed and checked by us then added to the list and can be viewed. There is also an option to be sent an email to keep you up to date with your List contents. Yes the Gift List can be closed at anytime with no charges at all. Simply select "Close your Gift List" option from the dashboard once you have logged in. If the account has had additions to it we will contact you in order to organise the delivery of the vouchers. We make it a point to not charge anyone for the use of our gift list service, we believe you should be able to keep 100% of the value of the pledges placed, to not be charged for the delivery of your own gifts or be punished for opening an account and not using it. The Gift List is completely free! No charges, no hidden costs, no commission and no penalties! We dont limit accounts to having shelf lives. We allow you to open a gift list as early as you like and close it whenever you like and the account is active the whole time for your guests to pledge money to and for you to customise. We do not charge you to close the account at any point, even if you register and then change your mind and want to close it, that' fine too. If there are any funds in your account when you close it you can withdraw 100% of the value in the form of gift vouchers and gift cards or the products you've selected at anytime. The only thing we do stipulate is that you redeem the total value of your account in one delivery. We don't even charge you for that delivery! When registering the List, there is an option to enter a password for the list. If you select this option and choose a password, only guests who provide that password can view the List. If you do not then the list is available to view by any visitors to the website. When letting your guests know about your account please remember to provide them with all the password if you set one so they can place an order online. If they choose to place an order over the phone they will not be asked for the password. No nothing at all, we do not charge anyone for the privilege of using our service. There are no fees what so ever for either the account holders or the guests pledging money. All you need to do to place an order for an event is to select the relevant event and then follow the instructions on screen. All we need is your name, address, value of the order, your card info and then a personalised message to accompany the gift so that they know whom it is from. We do have a few examples of nice messages for you to tweak if you cannot think of anything to say. The value pledged to your account by your guests is put into a secure holding account that can only be used for the purpose intended. It is not used for any other financial transactions. Voucher Express employs Verified by Visa / MasterCard Securecode which allows customers to protect their credit cards used online by assigning a secret password. If you have joined the scheme you will be required to provide your password during completion of your order. Voucher Express has no knowledge of, or access to, your password. To maintain secrecy your password is submitted directly to your card issuer, over a secure link, and does not get seen or stored by our system. We usually say about six weeks after the occasion date as a guideline to make sure anyone who has forgotten has the opportunity to be able to place an order before closure but that is not a set deadline. You can close the account when you are ready to or you have decided what type of vouchers you would like be sent. All you have to do is log in to your list then at the dashboard select "Close your account". Once we have received notification of that closure we will contact you to confirm your redemption choices and arrange delivery. If you choose to close your list down before 2pm Monday to Thursday your vouchers will be dispatched that same day with Royal Mail Special Delivery subject to stock but we will inform you of any possible delays and give you any available alternatives. If its a Friday then we cannot guarantee next day delivery as Royal Mail do not deliver to all areas on Saturdays meaning the vouchers will be sent on the Friday but could be delivered on the Monday . It will arrive before 1pm on most occassions and will need a signature upon arrival. The vouchers will be sent in a keepsake wallet with a letter of congratulations from ourselves and a list of the personal messages left by guests who have placed orders. We always appreciate comments about our service, good or bad. It helps us develop and grow so we provide the best service we can to our clients. If you do have anything you would like to tell us then contact us on any of the methods listed on the contact us page. We also send a feedback form along with the vouchers when you close the list so you can always fill that in and send it back in the stamped addressed envelope provided. Our offices are open Monday to Friday 9am - 5pm. Orders can still be placed online during that time and will be processed the next working day. You can also set up your list at any time but be mindful that closure requests made outside that timeframe will be processed the next working day.